Lose a drawstring on your favorite hoodie? That’s aggravating. Lose a drawstring on the waist of your favorite sweatpants? Now that’s an invitation for an embarrassing wardrobe malfunction. Today’s discovery makes it a cinch to re-thread drawstrings. You just insert the tool in the tunnel of the garment, hook the lost drawstring, then gently pull. No more hunting down safety pins or trying to stuff a pencil or knitting needle through a drawstring tunnel. 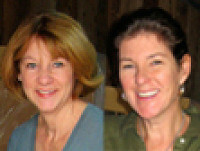 The Drawstring Tool is the brainchild of Hillary Fehsenfeld and Debbie Guthrie, two friends who teamed up to develop this patent-pending device. 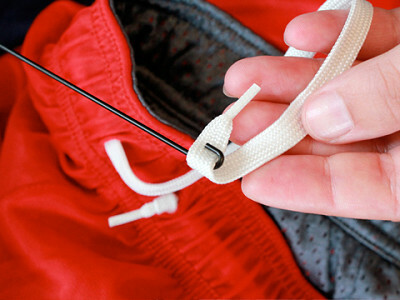 In addition to fishing drawstrings out of adjustable-waist pants, bathing suits and hoodies, the Drawstring Tool makes a handy gadget for unclogging drains and vacuums and retrieving small items that fall in hard-to-reach spaces, such as grates, grills, and that impossible space between the driver's seat and the center console. We’re hooked on this easy problem solver! Best Day… when the Daily Grommet selected us to feature our product! the drawstring has slipped back inside the tunnel! clothes than the ‘missing’ drawstring has probably happened to you! ....it's called a "wire hanger." It is actually more flexible than a wire hanger and it has an ergonomic handle. These have been around for hundreds of years without the plastic handle. It is a bodkin. A small crochet hook will do the same thing for much less. @Ginny: Bodkins are great for when you are completely re-threading a drawstring, but for just retrieving the end that has slipped back, this hooked tool is a great solution. Thank you for your comments. We would like to say that crochet hooks are thick and not flexible, so they do not always work. This is a new item to the market with spiffy handles, flexible wire! Did you know that you can also clean drains with this special hook?? I just purchased one of these tools a few weeks ago. I just want to thank you two ladies so much. This is the best tool for the job. I would suggest that every household in America have one of these tools. I did try using a crochet hook to get my string out of my husbands sweatshirt and it was too thick, I ended up ripping the sweatshirt trying to take it out. I also used the drawstring tool to retrieve a lost ring from the small space between the seat in my car and the center console THANK YOU!! Thanks for the great comment- we love the idea of using it to get something b/w the console and the seat! I have a Drawstring Tool, and I love it!! I have already repaired my lunch bag and 2 pairs of work out shorts. While it may look like a crochet hook with a handle, I have never seen a crochet hook this long. Personally, I think you should try something before commenting on it. I think this is the most useless item I have seen on Grommet. At 71 I have been using a wire coat hanger with a hook bent on the end with a pair of pliers for at least 61 years. I doubt you will print this because wire coat hangers are a dime a dozen and you won't make money. Don't let this keep you from promoting and selling items which ARE useful and less expensive. @William Harrington: We don't mind if you let us know that you don't like a particular Grommet. We feature a wide variety of products and know that each one is not for everyone. We love that you check in to see if we have discovered something that does appeal more to you. Let us know when we do! Looking at sales, many people are seeing the value in this useful tool. The preferred style right now is Leopard! I do not know who in thier right mind would prefer a hanger and a pair of pliers over this tool. This item has come in handy for me so many times!! I would choose this over a bent hanger and a pair of pliers any day!! Sorry you feel that way. It may be easy for you to manipulate a wire hanger and a pair of pliers but I know for many that may be awkward- especially those with arthritis. Thanks for your support Diane and Theresa. I am glad we have made your life a little bit easier! I've always used a large safety pin. Won't come unhooked and has worked on everything I've had. They shouldn't let people comment on here haha. If it only slipped back a little...just pull it out and rethread..not that big of a deal. This is a great idea but IMO, overpriced because of the "designer look". I don't need a designer look in my tools and I'd much rather pay half the price without it. Matter of fact, you can buy something very similar to this, and at least as long, in any store with an extensive sewing notions section. It's used for pulling cording or elastic through garments you've made yourself. (I assume people still sew???) I've had one in my sewing box for years, and I'd be surprised if even with recent price increases, it couldn't be had for $5.00 or less. If I didn't know better I'd think she was someone I knew, 'cause all my friends are geniuses!! Lose a drawstring on your favorite hoodie? That’s aggravating. Lose a drawstring on the waist of your favorite sweatpants? Now that’s an invitation for an embarrassing wardrobe malfunction. Today’s discovery makes it a cinch to re-thread drawstrings. 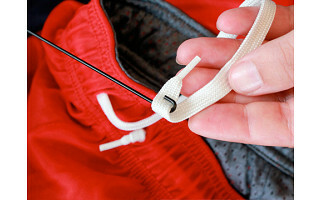 You just insert the tool in the tunnel of the garment, hook the lost drawstring, then gently pull. No more hunting down safety pins or trying to stuff a pencil or knitting needle through a drawstring tunnel.